Lately when grocery shopping, I find myself standing in front of all the colorful bell peppers and just can't help but buy one of each. Unfortunately on this last trip, Trader Joe's had sold out of red (my favorite) bell peppers. (How is that possible?!) So I settled for a yellow and an orange. I usually add them to pasta dishes that I make; but this time I wanted something that let the peppers be the main focus. I found this recipe searching online and got to cooking! 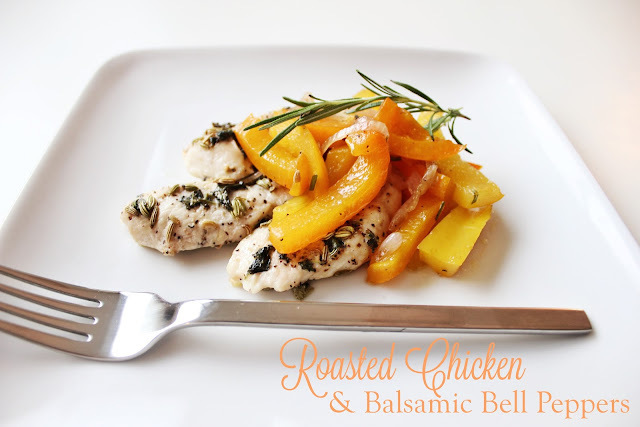 The peppers with balsamic have such a wonderful flavor combination. The chicken was great too, although I might season it slightly less on the next go-round.